This beautiful glass set features simple, clean designs to match any table setting. They can be used daily but are elegant enough to impress any guest for special occasions. All pieces are proudly made in the USA with crystal-clear, high-quality glass that is both stylish and durable, and dishwasher safe for easy cleaning. Glass Gravy Sauce Boat includes molded glass handle for easy access; 10 oz capacity. High quality glass butter dish comes with a lid and holds one stick of butter; measures 5 inches long by 3.25 inches wide. Glass cream milk pitcher comes with a spout and handle for easy pouring; 11 oz capacity. 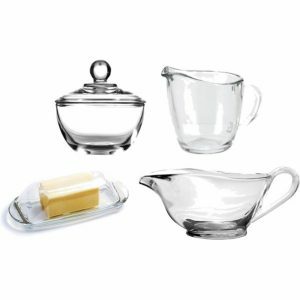 High-quality, crystal-clear glass sugar bowl has an 8 oz capacity and comes with an elegant lid. All pieces are Dishwasher safe and made in the USA.